Can you spot the difference between these two covers? It appears that AARP magazine had some second thoughts after publishing its October/November issue with a feature article titled, "Bill Cosby Still Making Us Laugh." The second version (pictured at right) shows no sign of the article. UPDATE: A spokesperson from AARP told The Huffington Post in an email that the magazine did not pull or remove any content. 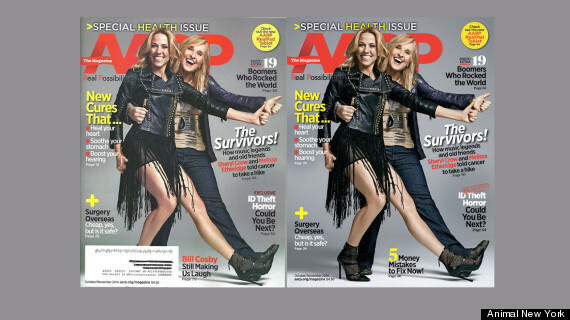 "AARP The Magazine is actually the only lifestyle publication that publishes three demographically versioned editions of its issue to members that address the evolving life stages of 50+ adults," the spokesperson wrote. "With AARP’s diverse member base, there are some differences in the editorial content and cover lines for each segmented version of the magazine to better suit subscribers of different demographics and readership."